If you are a regular reader of my blog, you would how much I raved about the online shopping website "Gamiss"! They have really stylish, good quality clothing at awesome offers! I already did a post on a plaid shirt that I got from Gamiss and I must say it has become my favorite shirt! Today I am going to show you a stylish stand up collar waistcoat that I wore a lot when the weather was neither too hot nor too cool! I also love wearing it during flights to keep myself warm! 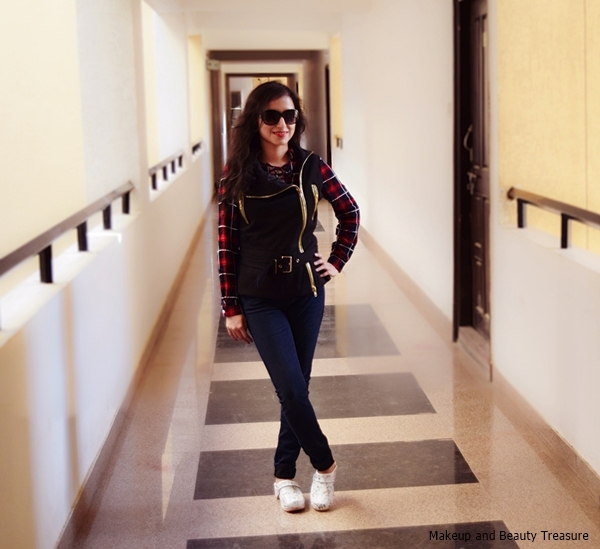 This stylish black jacket reminds me of my biker jacket! Though the material is made of polyester and not leather but it looks really chic and smart! It is available in 2 colors- army green and black and because my favorite color is black, I ordered black for me! I ordered L size that fits perfect! It has a stand up collar and makes you look stylishly elegant! I usually do not raise my zippers too high as I feel suffocated if there is anything too close to my neck *yes that's weird me*. 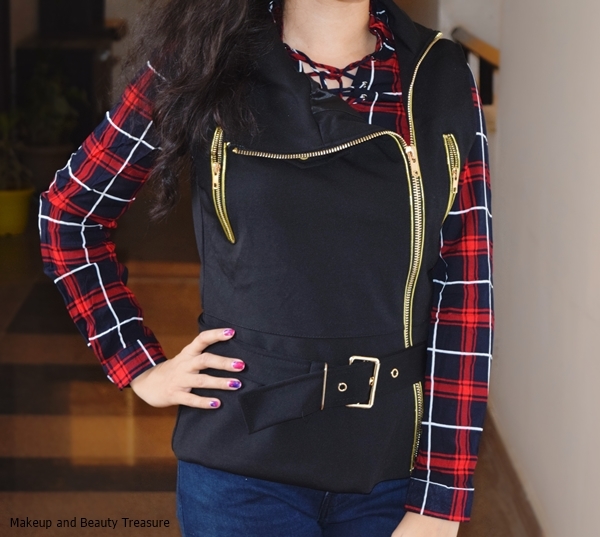 It is a sleeveless jacket that comes with a belt that allows you to wear it with a good fitting! The material is of very good quality and feels very comfortable against the skin! The zipper is also of good quality and the golden color complements well with black! It does give a warm feeling so it is perfect to wear during fall, spring or winter! I absolutely loved the zipper embellishment over the chest area! - Black can be worn on any color! - Perfect for fall or spring! - Made of good quality material! - Currently on a huge discount! 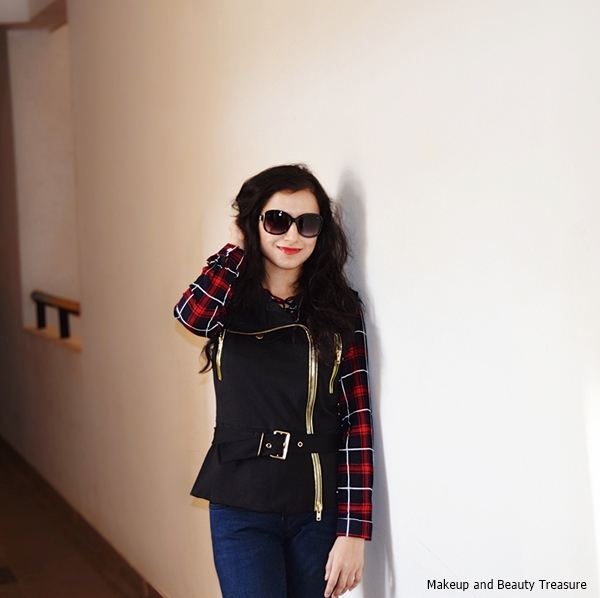 Overall Gamiss stocks really chic and stylish waistcoats that are worth checking out! 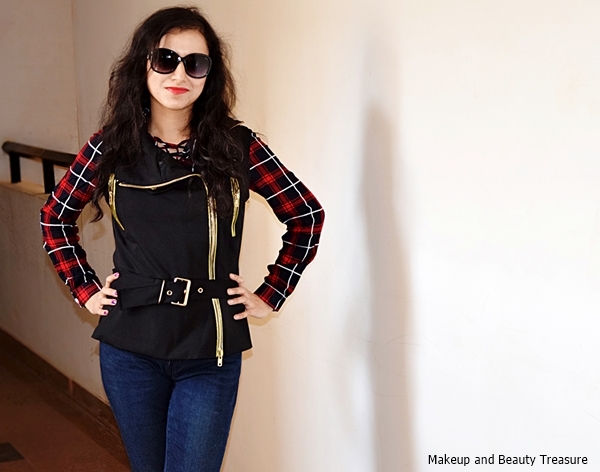 I loved my waistcoat and I love how stylish it looks on me! It instantly makes any boring outfit very interesting!